Kumbhar Hasan Umar is a famed potter from Bhuj in Gujarat. He takes up to five days to mould, fire and paint a batch of little bowls. Life was good till 2001, when the Bhuj earthquake levelled his home and his dreams. But when you belong to a legendary family of potters, and even carry the glorious "kumbhar" in your family title, life's experiments begin and end with clay. Umar and his family remoulded themselves to deal with life's fresh blows and burdens, letting the lack of appreciation for their craft sink in, and moving on with the times. Trying to create what the world would like - the garish, the glazed. Trying to get used to the spoken and the unspoken verdicts - who cares for your craft? Who cares for the beauty that the little imperfections lend to your creations? But they are not giving up yet. In fact, not ever. Umar's story is not his alone. The same thoughts, sometimes articulated, sometimes not - link almost all the old potters of India. 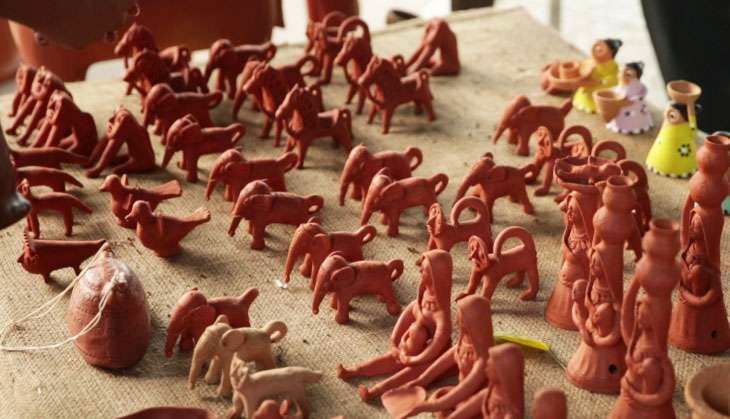 M Rangaswamy makes animal figurines - elephants, horses and bulls - to dedicate to the Lord Ayannar shrines in Tamil Nadu. It takes up to five people and five days to make one figurine. Once complete, they are placed inside a shrine - the figurine heads with their trademark head tilts in reverence to the god. "It's only here that you see these figurines placed in a lawn. Or in some affluent people's homes. 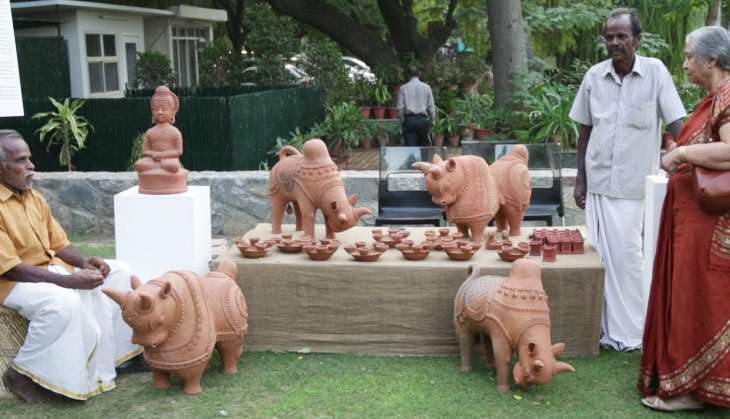 But traditionally their place is inside a temple or a sacred part of the house," says Rangaswamy, who is showcasing his pottery at an exhibition titled "In the Language of the Clay" at IIC. Rangaswamy is patiently entertaining queries on his craft and his village from those present to see the potters' exhibition. "You didn't get a special piece for me this time," an old patron of his works teases him. He indulges her a little, he knows how much she values his works, and how much he values people like her. What irks him is when people repeatedly tell him that his craft is expensive, his creations overpriced - especially when it comes from those who would spend a fortune on an assembly line product, but would bargain hard for a hand-crafted item. 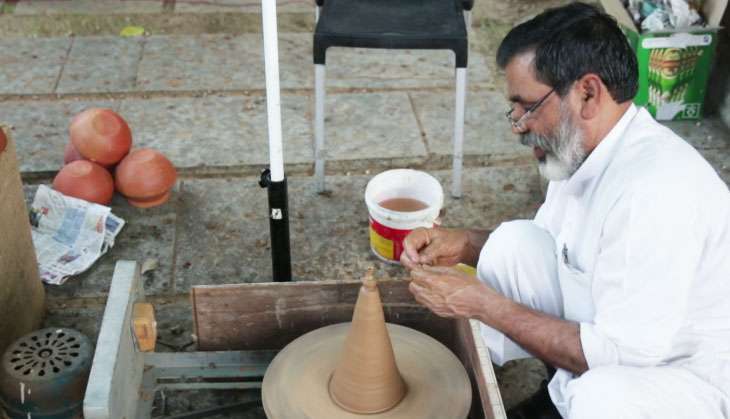 Harkishan Prajapati, a Delhi-based potter, also loses his cool when he gets told that his art is expensive. Holding a medium-sized terracotta bowl, he asks, "If I am selling this for Rs 750 how is this expensive? I have spent almost a week working on this piece." In the four decades or so that Prajapati has been making clay pottery he has not managed to own an outlet to retail his creations. He works from home, often on orders. "The middle class does not seem to understand the worth of clay pottery. I have almost given up on them. It's only the rich or people who appreciate Indian arts who understand the hard work that has gone into each piece," he says. The good news is those who appreciate the arts are doing their bit to help potters around the country. This exhibition is ample proof of their efforts. Curator of the exhibition Ritu Sethi says, "The scene is not dismal. We are doing our bit, giving them a push, helping them stay afloat. And believe me they are quick to learn, quick to adapt to the changing market." She gives an example. "If you tell them to stop using lead in their creations because that is harmful, they will. Tell them clay pottery is good for people with diabetes, they understand." With pottery not exactly a profitable business, the newer generations are trying to stay out, or practice the craft only to supplement the family income. Prajapati has six daughters. He has married two off, the next two in line help him at the potter's wheel. One of them is studying fine arts and the other is pursuing her post graduation in political science. Both are experts in making terracotta jewellery. "It is up to them if they want to take this forward. Who knows what will happen when they go to their own homes?" wonders Prajapati. You want to believe Sethi when you see Ranjana, a little girl from Gujarat, making a clay panel with mirror work. Her grandfather, Basar Bhura, lovingly looks at her and says that in his village the exterior of houses will continue to be adorned with inlaid mirrors. He is happy with the orders too - clay mirror panels of various sizes. "We make them on order and courier them," he declares proudly. Ask him if the breakage worries him, and he says, "No, we package it very nicely." Umar also entertains the odd order. "Where are the buyers?" he asks. "I have come with three boxes of pottery and will probably go back with two. And by the time I am back in my village there will be several broken pieces." Sethi is right when she says the scene is not dismal. But it will be - if adequate measures both governmental and voluntary - are not taken to back the grand potters of our country.